The goals for the county’s five boys high school golf teams remain the same — challenge for league titles and more. Twin Valley South’s Nathan Osborn finished seventh last season in the Division III state tournament to earn second-team All-Ohio honors. PREBLE COUNTY — The goals for the county’s five boys high school golf teams remain the same — challenge for league titles and more. With the return of several key players from a district qualifying team a season ago, Twin Valley South has its sights set on a return trip and a possible trip to state if all goes well. Under fourth-year coach Darcy Robinson, the Panthers return all-Ohio performer Nathan Osborn, Willie Bowman, Chance Parks and Connor Bradley. Last season the Panthers finished 13-1 in head-to-head matches and finished fourth at the sectional. Osborn and Parks are three-year letter winners, while Bowman and Bradley are two-year letter winners. Osborn enters the season as the three-time Cross County Conference Player of the Year, but has been hampered by an early season injury. He is the defending Division III district champions and placed seventh at the state tournament last year, earning second-team all-Ohio honors. Also back is Steve Bitner, who is a sophomore, and only played two matches last year. “He has improved tremendously over last year, and already has made contributions to your team this year,” Robinson said. Newcomers include freshman Jacob Clark, who has never played golf before this season. ”He seems to be progressing well and has a good attitude,” Robinson said. Robinson said she hoped the team could contend for the CCC title. Despite missing Osborn, Robinson is pleased with how the other players are stepping up to fill the void. “I’m very proud of how well our other players are stepping up and trying to fill the hole that Nate’s absence has created. Willie Bowman has shown that he is capable of competing with anyone, and Chance Parks has been coming through as our number 2 guy also,” she said. Eaton lost four seniors from a district qualifying team. The Eagles went 5-1 in the Southwestern Buckeye League Southwestern Division and finished second. As Randy Titkemeyer enters his 16th season he will be relying on senior Andrew Collins to be the team leader. Also back is Felix Durham who played well last year as a freshman. Sophomore Travis Pittman also saw some time with the varsity last season as well. Titkemeyer said the team in limited with its experience but the expectations are still the same. Last season, National Trail finished 10th in the CCC and second-year coach Troy Ferguson is hoping his team will improve on that. Back are a trio of juniors in Tyler Porter, Austin Knapp and Same Roberts. Newcomers include freshman Khyler Grant, sophomore Jesse Norton, junior Kevin Christensen, and sophomore, Drake Carrell. Preble Shawnee returns three players from a season ago, but still has a young roster full of players. Back from last season are juniors Luke Woodard and Caleb Barrett along with sophomore Levi Brock. “The 2018 Preble Shawnee golf team will be relying on the experience of Luke, Caleb and Levi to led the young program in the right direction,” said Shawnee first-year coach Ryan Klapper. Klapper said the goals for the season include improving our golf game, course management and learning how to compete in every match. “We have a cohesive group that should only help make us better. As my first year coaching golf I look forward to the challenge of leading this golf team to a bright future,” he said. New to the program this year is senior Cameron Gadd and junior Owen Swartz, as well as freshmen Dane Klapper, Ethan Woodard, Colton Groh, Kurtis Anderson and Griffen Bridgeford. Nathan Hans returns for his second season as coach at Tri-County North and has several key players returning, including district qualifier Ethan Kelley. The Panthers finished 6-6 in the CCC last year. Also returning is Alex Wayman, Dylan Curtin, Landon Owens and Spencer Brehm. New to the program is junior Matt O’Dell. 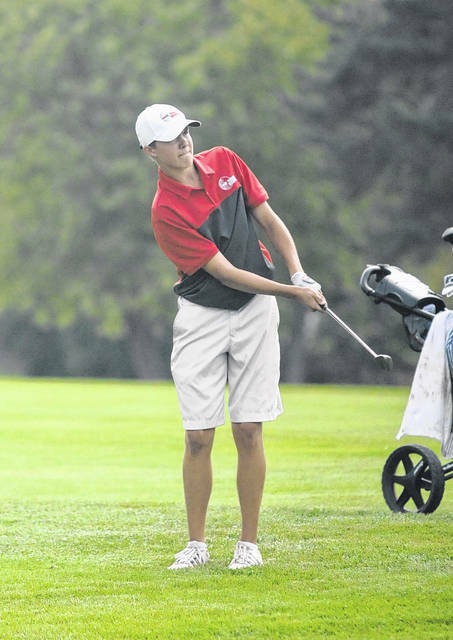 https://www.registerherald.com/wp-content/uploads/sites/41/2018/08/web1_tvsbg1_osborn.jpgThe goals for the county’s five boys high school golf teams remain the same — challenge for league titles and more. Twin Valley South’s Nathan Osborn finished seventh last season in the Division III state tournament to earn second-team All-Ohio honors.